This is the best true-to-life of the original that has been produced by Austria yet. Opposed from the issues of 1986, this one from 1953, does not use non-original languages [original is Latin] in the legend. See my 1986 version under Austria in the Moneta Museum. 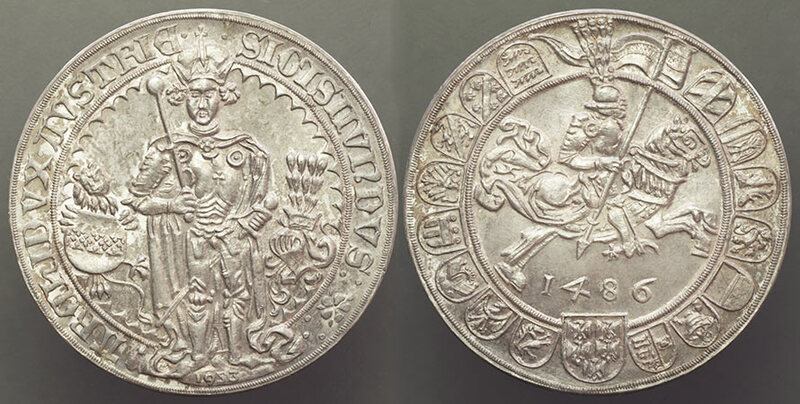 RX: 1486; Armoured knight on horseback, carrying banner; arms of 16 Austrian provinces around. EDGE: Tiroler Taler ~A900~ 1303-1953 ~ Hall Im Inntal~ [the date range here must indicate that this restrike commemorates 650 Years of the City of Hall, Tyrol]. An issue of 2007, featuring an incuse reverse, celebrated the 700 year anniversary of Hall, Tyrol Austria. The town has a lovely Web site that shows the mint museum where you can mint your own miniature version of the first Thaler on a real screw press. See this museum for an example. Elsewhere here in the Austria section of the Moneta Museum you can view an original from 1486, they are quite scarce and desirable with the latest nice example selling for $12,000.